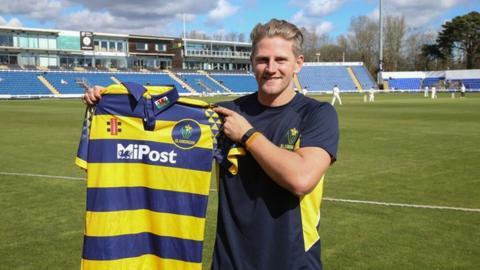 Glamorgan new recruit Timm van der Gugten is promising an attacking approach as he tries to force his way into the county's first team this season. The Australian-born paceman has been signed to add extra depth and variety to their bowling. "I'm a pretty attacking bowler. I like to bowl as fast as i can and get into the batsman's face" he said. He played for Netherlands in the 2016 T20 World Cup. Van der Gugten, 25, claimed four wickets in five overs in the brief Dutch campaign but has only made five first-class appearances for New South Wales, Tasmania and Netherlands before joining Glamorgan. "I first came into contact with Hugh, came over, watched a few games and really enjoyed the vibe," van der Gugten added. "I don't have a great deal of first-class experience and the conditions are going to be very different over here, but I'm looking forward to getting stuck in and learning from everyone. "I like all the formats but I'm probably looking forward to the four-day comp the most." Glamorgan relied heavily on the fast bowling trip of Michael Hogan, Graham Wagg and Craig Meschede in 2015. The county hope that the signing of van der Gugten together with the potential emergence of Ruaidhri Smith and Jack Murphy will allow them to ease the workload on their key men. Hogan, 34, has bowed out of domestic cricket with Western Australia as the leading wicket-taker over the last five years in the four-day Sheffield Shield competition. "I had a decent season but it's nice to go on a high over there and I've been in decent form. "I 'retired' three years ago before they changed the rule (on eligibility) so I was happy to get the extra three years out if it. "It was a bit of a sad day, but everything's got to come to an end and I'm happy to be here now." But Hogan has few thoughts of easing up in the British county game despite the management's hopes of spreading around the bowling duties. "I like to play every game I'm available for! I suppose if you get flat and there's an opportunity to have a game off I'll take it into consideration, but I like to keep rolling on," he added. "I guess we have got the depth this year with a few extra options and we've got Craig Meschede full time as well (after a loan season in 2015). "Timm's got that 85 to 90 miles an hour factor to him, so that's something we haven't had for a few years so maybe he can hurry a few guys up, maybe scare a few guys in this division."